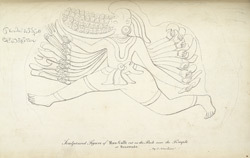 Pen and ink drawing of a sculpture of Kali from Vijayawada in Andhra Pradesh, by an anonymous artist, part of the MacKenzie Collection and from an album of 37 drawings (43 folios) of sculpture at Jajpur, Puri, Bezwada and Sitanagar made during a journey from Bengal through Orissa to the Coromandel Coast, dated 1815. Vijayawada, formerly known as Bezwada, was an important centre from the 5th-6th centuries and its strategic position along the coastal trading routes of the Bay of Bengal determined its economic importance through the centuries. The town is surrounded by picturesque hills and the river Krishna flows nearby. There are a number of important Hindu and Jain temples in the town, and two Hindu cave temples are located 8 km away in Undavalil. This drawing is representative of a figure of the goddess Kali, the fierce and terrifying consort of Shiva. She is depicted running after her victims holding weapons in her multiple arms.